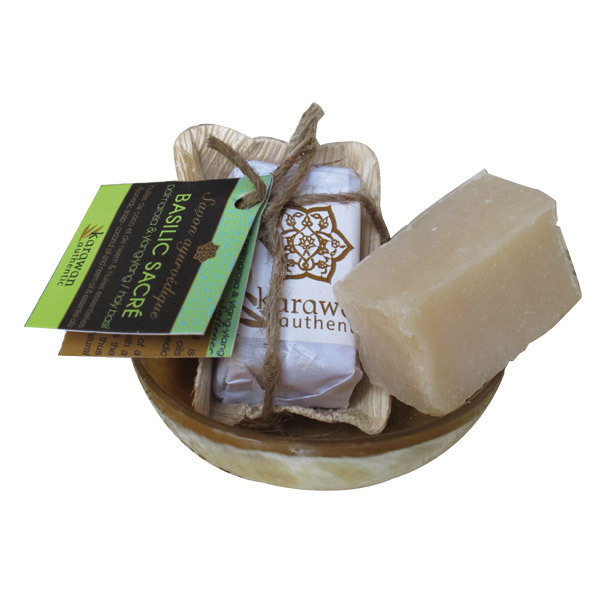 The Karawan ayurvedic soap is presented is a beautiful decortive basket, ideal for having in your guest bathroom or to simply add a special tuach to your bathroom. The soap is made the natural and traditional way offering the best care for your skin. 20g. - composition: pressed coconut oil cold, neem oil, pure essential oils of holy basil, galangal, patchouli, ylang ylang, palmorosa, Vetiver, geranium, lavender, orange, sugandhmantri. Karawan, producers of natural products that support fair trade. The brands original product was the Aleppo soap, it is exclusively manufactured in Aleppo with olive oil and bay leaf (laurel), all ingrediants are also carefully selected to give you the best quality product. Karawan now offer a wide range of products that are made using minerals extracted from natural ingredients. The quailities that these products offer and their pure composition are the key elements that have made the brand so reliable and respected. Relax and enjoy a moment of pampering with Karawan products and beauty accessories.